In preparation for the arrival of Wolfenstein II: The New Colossus next year, head on over to the eShop and download Aces of the Luftwaffe – Squadron for a bit of Nazi blasting fun. Take to the skies above iconic USA locales as part of a crack squad of pilots who are tasked with ending the threat of a secret German commando dubbed The Aces of the Luftwaffe. Their dastardly plans must be stopped, including the likes of nuclear warheads, mass destruction, and poison gas clouds. In this top-down, vertical shooter you will shoot down Nazi plane after Nazi plane. The entire campaign is playable either in single-player or in co-op with up to four players. You’ll shoot, dodge and power your way through countless enemies all in the name of the USA – it’s up to you to save it from total destruction. The game is split into five worlds made up of a few stages each, with a face-off against an Ace of the Luftwaffe acting as a boss battle at the end of each world. The gameplay is simple enough. You move your plane around with either the d-pad or analogue stick and press “A” to shoot (you’ll be holding that button down a lot, trust me). And there are your basics. There’s a little more to it than this, but these are the controls you’ll be tasked with remembering the most. Aside from your basic movement and shooting, your pilot can also make use of special abilities (that always load up as the game is going until you can use them). With a tap of the “X” button, you’ll be sending fiery balls of doom showering down on your opponents, placing a shield around you and setting off a huge explosion that damages everything on screen. Along with these special abilities, you will (every now and then) send separate attacks throughout the screen and hurtling into your enemies. As is told in shoot-em-up folklore, your standard weapon isn’t the best. Enemies will drop weapon upgrades (which have limited ammo), making your previous weapon your new sub-weapon which will fire off every so often. While I wish that you were given control over these sub-weapons (the laser ones are very useful), they do provide a handy extra attack to crush your foes. I would have liked to be able to control the wingmen better, too. I understand that the game is designed around co-op (which works well, to be fair), but too many times you will see your wingmen take loads of damage because you cannot move them out of the line of fire. You have no control over their special abilities, either. What’s the point in levelling up your wingmen’s abilities if you can’t choose when to activate them? I would have loved to be able to use the healing one when I wanted to, and not when the computer randomly decided to. Indeed, you may have noticed that I just spoke of levelling up the four pilots – this is something you can certainly do. You earn tokens by completing levels, levelling up your overall pilot level via the collection of medals that all downed enemies drop. Each new upgrade costs at minimum one token, so spend wisely! 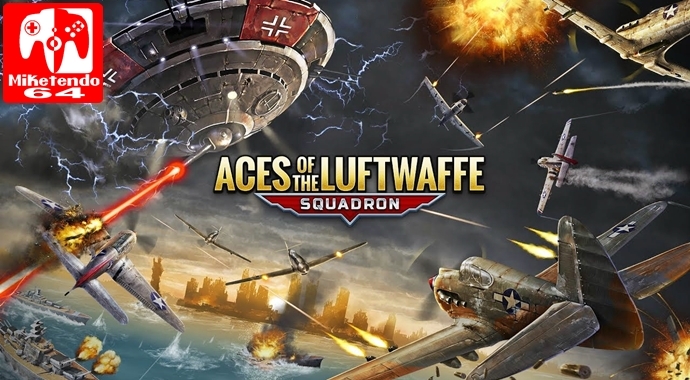 The levelling system and score attack style arcade gameplay make for some entertaining playtime (the achievements and bonus missions in each stage make good reading for all you completionists out there, however), but Aces of the Luftwaffe – Squadron is over very quickly and suffers in other areas. It’s hard to buy the premise and a lot of the story thanks to the voice-acting, for example. You are meant to be piloting American aeroplanes, shooting down the Krauts (a word used time and time again throughout the game), but everyone in the game speaks with a German accent. I know the game was developed in Germany, but it gives the whole thing an unfortunate, cheap feel. To be fair, the main man (who suffers from an old poison-related injury) was brought up in Germany, so you can excuse his accent, but the others? Nah, it’s just cheaply made. Aces of the Luftwaffe also suffers from poor writing. It all feels like a naff version of the underrated Codename: S.T.E.A.M, with characters interacting with each other in light-hearted, comic-book style banter. The issue is, a lot of it is on the nose, with each character suffering from their own affliction (poison, sleeping, rage and fear of heights). The game asks us to understand each character without much explanation, and when it’s given, it just feels forced down our throats. It’s light-hearted, but poorly executed, awarding the game an odd, cheap feel throughout. I was annoyed by the character quirks, rather than finding the whole thing entertaining. It felt like the design and writing team didn’t know when to stop. The game’s production values are odd, too. It looks fine, with a sheen to it, but the strange 3D models look off in the 2D world. The world, too, is bland – it’s supposed to be the USA, but frankly, it could have been anywhere if it weren’t for an ugly rendition of the Statue of Liberty. It runs fine on both handheld and docked, but you won’t be blown away by either. Nor will you be blown away by the lengthy load screens that force you to wait an ungodly time between each stage, which can be especially frustrating during the dramatic spike in difficulty at the endgame. There are just too many things holding Aces of the Luftwaffe – Squadron back from being as entertaining as it could have been. Stick to 1942. Not a terrible shoot-em-up, but there are better on the Switch’s eShop. It channels the spirit of Capcom’s classic 1942, adding a camp comic-book aesthetic not too dissimilar to that of Nintendo’s Codename: S.T.E.A.M but is far from either in terms of quality. Decent gameplay, upgrades and ideas are buried underneath poor dialogue, shoddy voice-acting that takes you out of the game and shockingly long load-screens. We’d recommend Two Tribes’ rather good Rive: Ultimate Edition over this any day if you’re after a quality arcade shoot-em-up.